In many business models, companies charge their customers variable amounts based on their consumption of products or services during a defined period. Such usage data billing scenarios (aka metered billing or pay-per-use) may range from electricity or phone calls to worked hours in a service project or API calls in a SaaS business. Common to all of them is that you bill the customer on a regular basis - according to your billing cycle, and the amount varies - based on how much of the product or service the customer has used. Take an example: A company controls their deals, involved products etc. using opportunities and opportunity products. One of their typical products is a subscription-based service, where the usages to be charged vary. Now assume that this service sells a lot - the company wants the new subscriptions to be recorded automatically, and, of course, invoices automatically issued based on the actual service consumption. To this end, you combine JustOn's automatic subscription building and usage data billing. (1) The company offers the service package, represented as a product in Salesforce, and creates a master subscription including the item, which is potentially to be invoiced. (2) A customer subscribes to the service, and, in order to track the new deal, the company creates a new opportunity with the product attached. (3) JustOn generates an account-specific subscription based on the master subscription and the new opportunity. (4) The company continuously renders the service and tracks the actual usage consumed by the customer. (5) JustOn periodically retrieves the usage data and saves it to a specifically configured object, for example, event. (6) Upon the periodical invoice generation, JustOn itemizes the saved usage data, matches it against the defined subscription items and evaluates the provided quantity information, calculating the item's subtotal. Modeling this business use case with JustOn comprises at least the configuration tasks as listed below. Basically, a master subscription is a usual subscription that is not assigned to an account. That is, you just create a subscription, add all items and define any required conditions to be cloned, but do not assign it to an account. Do not assign the subscription to an account. The field Account may be set as required, however. In this case, navigate to the Subscription page layout, open the field properties for the Account field and deselect the Required checkbox. The subscription name will be used as an input parameter when configuring the target object. JustOn recommends to prefix the master subscription name with MASTER. In the Items section of the new subscription, click New. The subscription builder requires a number of ON fields on the opportunity as the target object. ON_Account Formula (Text) Specifies the Salesforce account ID or external ID. ON_Subscription Lookup (Subscription) Links to the related subscription. With Salesforce CPQ installed, make sure to relate to the correct Subscription object. For details, see this article. ON_SubscriptionBuildError Text (255) Shows the error message in case the subscription creation has failed. Formula Specifies the name of the master subscription (which serves as a template and will be cloned). If configured as a formula field, the master subscription name is used for every record. Depending on your use case and its requirements, you can add more fields to have them copied to the generated subscriptions. For details, see ON Fields on Objects. To define which objects and records to include in the subscription build process, you create a new custom filter. Create the following filter for the subscription build. Child Relation () Specifies the name of the child object. Required if you create items based on the child records. You can set up a job in order to have subscriptions built automatically on a regular basis. The subscription build job does not require additional parameters. That is, you can set up the job directly for the corresponding batch chain SubscriptionBuilderChain. For details, see Scheduling Concepts. To schedule the subscription build batch chain, you can use either JustOn's Scheduled Jobs page or Salesforce's Schedule Apex functionality. For details, see Scheduling a Job. From the Apex Job drop-down list, select Subscription Builder Job. The Job Name field is automatically set to SubscriptionBuilderChain. This sets up the subscription build to be executed at the specified time. The transaction builder requires a number of ON fields (controlling fields and data fields) on the object customized to hold usage data. Following the example, you configure the Event object accordingly. Navigate to the fields list of the custom object. Picklist Controlling field, defines the type of the created transaction, either Transaction or Detail. When using the continuous invoice run, set Transaction as the value. Text Controlling field, represents the key to match source data to a subscription item. ON_Subscription Lookup (Subscription) Controlling field, links to the related subscription after the object records have been successfully processed. ON_Invoice Lookup (Invoice) Controlling field, links to the related invoice after the object records have been successfully billed. ON_LastError Text (255) Controlling field, displays the error message if the transaction creation has failed. ON_Account Formula (Text) Controlling field, specifies the Salesforce account ID or external ID, required if there is no or more than one account lookup on the object. ON_AddToTransactionTable Checkbox Controlling field, required when using the continuous invoice run. Determines whether to show the transaction on the invoice, deselected by default. ON_AddToCsv Checkbox Controlling field, required when using the continuous invoice run. Determines whether to export the transaction as CSV, deselected by default. Date Data field, displays the date on which the transaction is considered for invoicing. Number Data field, specifies the quantity or volume information as accumulated for the transaction. Depending on your use case and its requirements, you can add more fields to have them filled and copied to the generated invoices or invoice line items. For details, see Fields on Custom Objects. To define which objects and records to include in the transaction build process, you create a new custom filter. Create the following filter for the transaction build. Use Case Specifies the filter use case, either Transaction or Continuous. When using the continuous invoice run, set Continuous as the value. Note that objects on which ON_Subscription and ON_Invoice is already filled will be ignored. 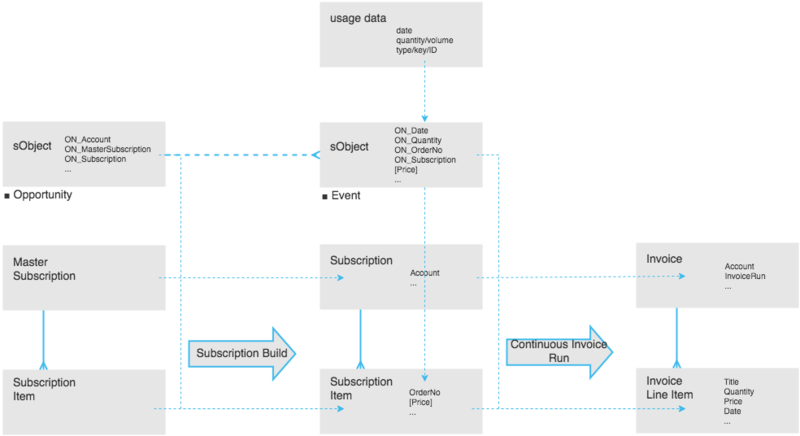 The continuous invoice run creates invoices and invoice line items directly out of objects that hold usage data. It uses the transaction builder functionality to itemize the consumption data, but does not generate "tangible" transaction records. As the name suggests, it can run multiple times, repeatedly aggregating new usage data to existing invoice line items as long as the invoice is Draft. To set up a continuous invoice run, you schedule a parameterized invoice run with the corresponding transaction filter (use case Continuous/Continuous Daily) added as a parameter. Make sure to set the transaction filter name as defined in Creating Transaction Filter. You can set additional parameters as required. This sets up the invoice run to be executed on a regular basis at the specified time with the additional parameters set.